The birds sing their songs in the high branches of four towering Manitoba maples that create a magnificent canopy over our yard. I can tell the ravens, magpies, bluejays and woodpeckers from their distinctive calls and often rush out of Birdsong Studio to say hello. This is the most visually unappealing time of year as the snow melts, thaws, and resolves itself into a mucky mess, but the birds and squirrel don't mind. They know that an end has come to a long and cold winter. Birdsong Studio is a small out building in our backyard. We measured it the other day at roughly 11' by 19'. It's not that big, but big enough to give me a place to work and hold small painting workshops, one of which is coming up tomorrow from 1 to 4 pm. In this particular three hour session, we are going to paint an exotic animal of some kind. Suggestions have been made for a bear, sloth, hippo and rhino. To be honest, I probably won't decide until tomorrow morning. Guests arrive, pick their spot - we only have room for 6 - and the three hours goes by in a flash. 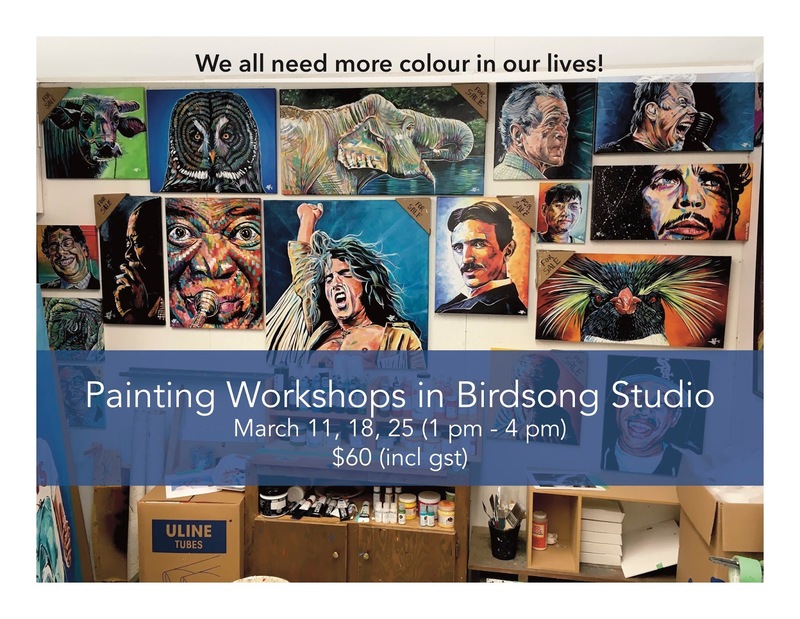 Do you need to be an experienced painter or artist to participate? Absolutely not. In fact, no experience can sometimes be the best experience. I've seen many people who have never painted before create some beautiful and unique work. Does everyone paint the same thing? Yes. However, they each create a painting that is all their own. "This ain't no paint nite," I always say at the beginning of a session. There will be no step by step, grab this colour and do this, kind of instruction. Instead, I provide the means of conveyance, but you get to decide, and create, the destination. What do you have to bring? Other than comfortable clothing, absolutely nothing. We provide all the supplies. 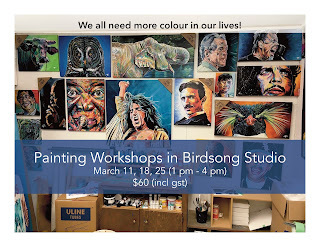 A three hour painting workshop in Birdsong Studio is $60. You can sign up by clicking here.